Your fascinating journey begins with your flight to Amsterdam. Your fascinating journey begins with your flight to Frankfurt. Note: Depending on sailing conditions, Worms may be substituted with a stop in Speyer where a walking tour will be included. Single room supplement is $1249. Reservations for this tour can be made by phone (1-800-337-7773) and will be confirmed upon receipt of $300 non-refundable, non-transferable deposit which must be received within 48 hours of reservation. Full payment is due 90 days prior to departure. Baggage fees may apply. Space and prices subject to availability. For complete booking information and terms & conditions click here. The following optional tours may be offered on during your trip. Note that not all optional tours are available on all departures. Pricing is subject to change. Payment (non-refundable) should by made by cash only. The tour covers the entire area known as the Red Light District. This neighborhood where everyday life is just a little different than our average Amsterdam neighborhood. Join us on this walking tour to discover that there is a whole lot more about the Red Light District that meets the eye. Being the oldest part of the city has a long and turbulent past and perhaps even an uncertain future. We’ll take you along the historical parts, the latest additions and the most colorful alleyways. Stroll along the busy canals, roma the narrow streets and we will make sure you will have a full understanding of this world famous and exciting piece of Amsterdam. Rudesheim is a historic city of winegrowers dating back to the Romans. The old town, dating from the Middle Ages, and parts of the city’s fortification like the Adlerturm (eagle tower) are meticulously maintained. Here you will find cozy traditional wine taverns in historic half-timbered houses. No tourist leaves this international well-known city without visiting the world-famous Museum of Mechanical Instruments. Here you will see a vast collection, dating back three centuries, of fascinating musical instruments that function like computers, ranging from tiny, delicate, music boxes to metal discs to enormous orchestra ensembles- all powered by mechanical ingenuity. Tools and machines for the production of organ pipes, cardboard sheet music, rolls of sheet music and perforated disks are also on display in the collection. Please note: In case the Museum of Mechanical Instruments is not available, it will be replaced with a visit to a local wine cellar with wine tasting. This elegant, luxurious, boutique style vessel was designed in an old world grand yacht style. All cabins are approximately 150 sq feet with modern amenities including beds that can be stowed away during the day to create extra space to relax, air-conditioning/heating which can be regulated individually, a mini safety deposit box, a telephone, and a hair dryer. Cabins on the main deck have panorama windows while cabins on the upper Promenade deck will have new french balconies. The superb public areas include a panorama restaurant, cozy bar and lounge, a fireplace, a gym, sauna, library, and sun deck! 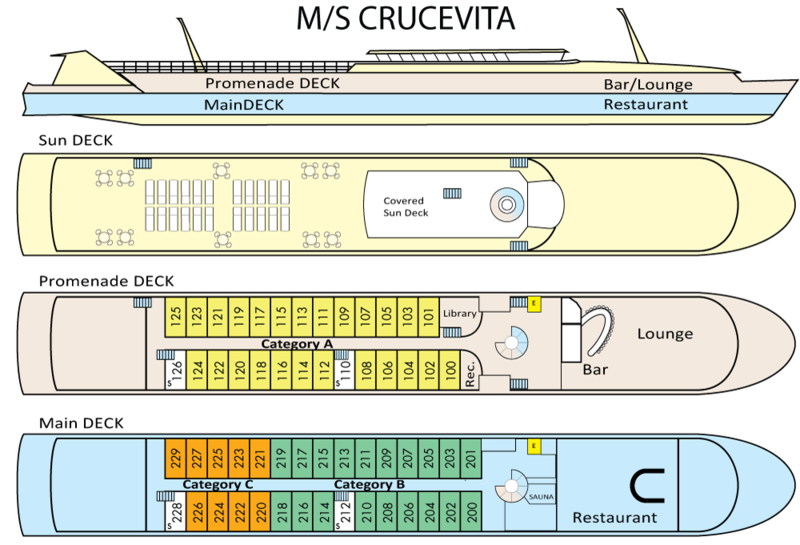 The decks are interconnected by a regular elevator suitable to carry up to 4 persons. The currency on board the ship is the Euro. Your flights from New York and back are on the following airlines with the corresponding schedules. We recommend that you arrive at the airport at least 3 ½ hours before the scheduled departure. The above airlines does not assign seats in advance. Please note that smarTours is not involved with your seat assignment. It is between you and the airline! Seat assignments can only be arranged upon check-in at the airport. Main Tour Itinerary A: Land-only services start upon independent check in at the boat in Amsterdam on Day 2 of the itinerary listed on our tour page. Land-Only services end after breakfast on the boat in Mainz on Day 9 of the itinerary. 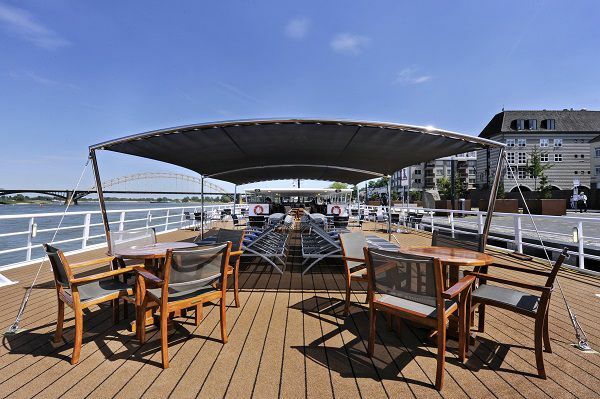 Main Tour Itinerary B: Land-only services start upon independent check in at the boat in Mainz on Day 2 of the itinerary listed on our tour page. Land-only services end after breakfast on the boat in Amsterdam on Day 9 of the itinerary. In April you can expect daytime highs in the 50’s with nighttime lows in the mid-30’s to low 40’s. In May daytime temperatures typically range in the 60’s to low 70’s and cool to the high 40’s to low 50’s after the sun goes down. In July and August you can expect temperatures in the 70’s during the day and in the 50’s during the evening. September daytime temperatures are typically in the mid 60’s to low 70’s and cool to the low 50’s. It can rain on occasion year-round so consider bringing a waterproof or water-resistant jacket. On the cruise ship and some stores during your shore excursions will accept major credit cards. However, for “street shopping” you will need local currency. It is recommended that you bring along cash in small denominations. On board the Euro is the accepted currency. Credit cards may be used on board (Visa or Mastercard only), but a service charge may be applied. As of May 2014, European credit card processors require credit cards with chips and a 4-digit PIN code. On board the ship the electrical current is 220V/50MHZ and you will find a round pin electrical socket. You may need a universal transformer to convert the current and an adapter to fit the outlet/plug. Electrical current requirements range from one electronic device to another; please check your chargers and electronic devices prior to travel. Very good value for the money. Sicilian chef had a varied menu for each meal. We are vegetarians and had something different for each meal which is a rarity! Unlimited beer and wine at lunch and dinner were definitely enjoyable! The ports of call were beautiful although most of the local tour guides were on a mission to tell you what they knew and didn’t want to address our questions. However, Otto in Koblenz was amazing! The tour guide in Rotterdam was actually rude and combative when a fellow traveler informed him that we couldn’t hear him when he turned his head. The guide reprimanded him and told him he should have informed him sooner! We left the group after that. The keyboard player in the evening was good but he needs to expand his repitoire of music because by the third night he was repeating the same songs. The crew was attentive and helpful. The ship very clean and the room size was rather spacious for a river boat. This being a Russian vessel, the only TV channel, RTV was totally right wing.